“Failure to Thrive” is a term well-established in the world of clinical medicine. In the pediatric context, it refers to a child who is failing to achieve anticipated developmental milestones. In the adult world, it’s more informally used to describe someone who is simply not doing well in their current circumstances, be it in hospital or in their community setting. Examples would be an elderly patient at home who is slowly declining and losing ability for independent living, or a hospital in-patient who is not improving despite what seems to be appropriate treatment. The concept, I’ve come to appreciate, can also be usefully applied in the context of medical education. Failure to Thrive in Medical School Syndrome (FTMSS), can be engaged as we would any clinical condition, with characteristic signs and symptoms. Absenteeism, or habitual lateness for scheduled events. Habitual failure to meet established deadlines for submission of academic reports or administrative requirements. Inter-personal conflicts with peers, administrative staff or faculty. Poor or unprofessional behaviour in the academic or clinical setting. Lack of attention to surroundings, or personal appearance. Symptoms of the FTMSS sufferer might include lethargy, fragile confidence, diminished sense of self-worth, agitation, defensiveness, anxiety. As with the approach to any medical syndrome, the objective is not simply to make a diagnosis, but to establish the underlying cause. Understanding the mechanism by which this syndrome develops is essential to helping the sufferer deal with the affliction, establishing appropriate treatment, and hopefully starting down the road to cure. All the manifestations of FTMSS have the common feature of not being attributable to any intrinsic limitation on the part of the afflicted individual. Having come through the intensely competitive medical school admission process, it seems reasonable to assume that every medical student is fundamentally capable of performing academically, being on time, meeting deadlines, relating reasonably well to others, attending to their personal appearance and behaving professionally. Failure to do any of these things can therefore can reasonably be attributed to some external cause. Failure to adjust to medical education. The medical school curriculum, learning methods and, importantly, the use of assessment in medical school can vary considerably from many other undergraduate programs. Fundamentally, the goals of education are no longer strictly about the aspirations of the learner, but rather geared to preparation to meet the needs of future patients. This change in focus can be somewhat unsettling for some. Moreover, the curriculum can be intense and demanding. Educational methods include much small-group and collaborative activities, as well as required independent learning. Assessments can be frequent and geared not towards short term retention and determining comparisons with other learners, but in assessing individual achievement with respect to learning objectives. In medical school, students therefore find themselves confronted with a learning environment very different than that which they’ve experienced previously. They are also asked to established individual rather than comparative goals of achievement. All this adjustment can be difficult for the student who is accustomed to learning situations which are individual, easily self-controlled and targeted to parameters of external validation. Lack of motivation for a career in Medicine. For many students, the decision to engage the medical school application process begins at a very early age. The process can be all-consuming and require the applicant to forgo many opportunities and experiences usually undertaken in childhood and adolescence in order to undertake educational programs and volunteer activities that they, and perhaps their parents, feel relevant to their application. The decision to pursue a career in medicine can therefore prevent a young person from engaging valuable developmental experiences or from considering other interests and potential career options. Others may enter medical school with an incomplete understanding of a medical career. As they understand more clearly what doctors actually do and what is expected of them, they may begin to realize the career is not for them. Medical education and, more importantly, a career in medicine, are both rewarding and demanding. Both require deep commitment. Unresolved personal issues. Medical students, like all young people, experience a variety of personal stresses and adversities. There can be a reluctance to recognize or to admit to the full impact of such stresses and to seek help. There can be a concern that admitting that one is feeling challenged or overcome by such circumstances might be seen as signs of internal weakness or unsuitability for their chosen career. There can also be a tendency to defer feelings of loss, disappointment or grief. Over time such unresolved stresses can mount and express themselves in negative ways which may lead to the various manifestations of FTTMS. Medical students can become ill or simply run down. Many medical conditions can be gradual, subtle and insidious. Accumulated fatigue due to lack of attention to simple things like regular sleep habits, nutrition and fitness can gradually mount and imperceptibly affect performance. Not unlike practising physicians, medical students can have a remarkable ability to ignore features of illness and fatigue in themselves which they would very quickly recognize in others. Mental illness. Medical students, like all young people, could suffer from chronic mental illness or develop such conditions after entering medical school. These can be very difficult to recognize in oneself and there may be stigma associated with such conditions that inhibit affected individuals from recognizing their full significance or in seeking help. The objective of any faculty advisor or mentor engaging the FTMSS sufferer, of course, is to help the afflicted student understand the problem and therefore engage effective therapies. The clinical approach for students exhibiting signs of FTTMS, ultimately, is not unlike that for other conditions that have behavioural manifestations. It begins with understanding and acceptance that the troublesome behaviour likely has an underlying precipitant that can be defined and therefore managed. Diagnosis requires a thorough history focused on the potential causes listed above, and features that may help identify the underlying, culprit problem. Having identified a potential underlying mechanism, counseling is required to help the students themselves understand cause and effects. Together, management can be engaged. What happens when none of the potential mechanisms seems to fit, and we come up with an idiopathic etiology? In my experience, this is very rare, but obviously troubling. Are we simply dealing with a poor “fit” for medicine? In such cases, we should provide compassionate support and oversight – what some clinical colleagues would term “watchful waiting”. Clarity usually emerges with time and, with it, the optimal approach becomes obvious to all. 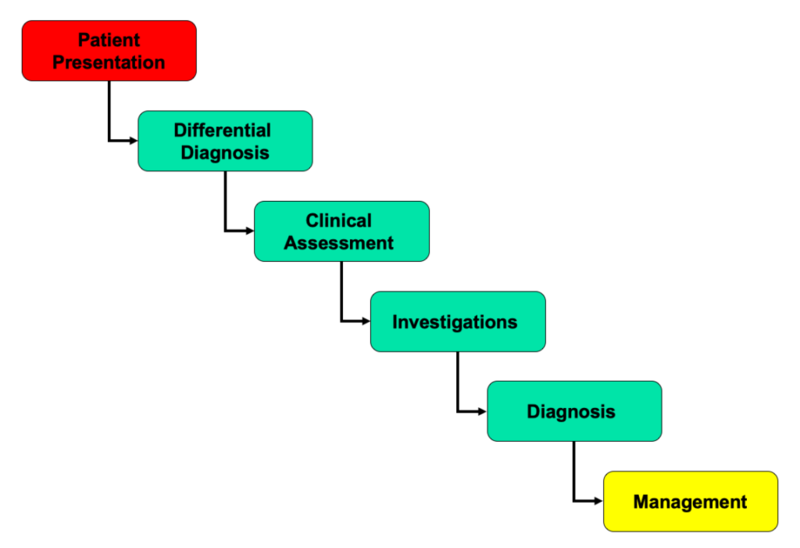 And so, the process for assessing a medical education problem bears remarkable similarity to the process we teach and use for any clinical problem. Once again, there’s a striking parallel between patient care and medical education. Doctors instinctively engage their students as they do their patients. Without judgement, but rather thoughtful contemplation of how observed manifestations reveal underlying mechanistic causes, leading to understanding and, with it, effective intervention. Next PostNext Medical Variety Night 2019 presents: Circadian Rhapsody!